The Martian surface, as imaged by the Instrument Deployment Camera attached to InSight’s robotic arm. After six years of planning, $814 million in development costs, and a successful 300-million-mile journey to Mars, the key for NASA right now is to exercise patience. InSight landed at Elysium Planitia, a flat plain located just north of the Martian equator, on November 26, which already seems like an eternity ago. We haven’t seen much from the probe yet, aside from a dusty photograph taken during the landing and a neat but subdued image of the probe’s immediate surroundings. We’re finally at the stage, however, when the mission operators can start to unfurl, very slowly and methodically, the probe’s various instruments, including its six-foot-long (2-meter) arm. The robotic appendage appears to be functioning normally, as does the Instrument Deployment Camera attached to its elbow. Eventually, the arm will be used to pick up science instruments from InSight’s deck, gently setting them down on the Martian surface. Once the mission is fully up-and-running, this tool will be the first robotic arm to shove instruments into the surface of another planet, including a seismometer and a heat flow probe. Indeed, more images will be required to paint a full picture of InSight’s new digs, but this place looks amazing—especially for a probe designed to drill through the Martian surface. Photographs taken by the probe show a relatively flat, dusty surface, free of troublesome rocks. There was always the concern that the probe might land on top of a large, partially buried rock. Imagine, for example, if InSight had landed atop one of those boulders on the horizon, as pictured below. A zoomed-in view of the Elysium Planitia horizon, showing some rather large boulders in the background. InSight has another imaging tool, the Instrument Context Camera, which will gaze at the terrain immediately around and beneath the lander’s deck. Photos produced by this camera won’t be nearly as pretty, but they’ll serve a utilitarian function. Unfortunately, and despite a protective cover on the Instrument Context Camera, dust somehow managed to get into the lens, according to NASA. The landing site is wonderfully smooth, as imaged by the Instrument Deployment Camera attached to InSight’s robotic arm. NASA says InSight’s instruments may not be fully positioned and calibrated for another 30 to 60 days. One of these instruments, the Auxiliary Payload Sensor Subsystem, will eventually collect vital meteorological data, such as wind speed and air temperature. 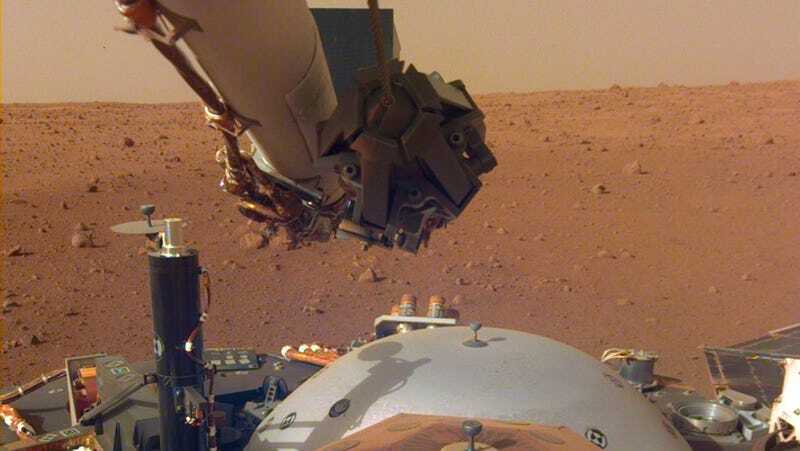 That said, the probe’s pressure sensor appears to be working, and it’s already detected a sudden drop in air pressure, a possible sign of a passing dust devil, said NASA. Indeed, NASA is deliberately taking it slow, as per the plan. InSight, for example, is equipped with a feature such that any unexpected reading will automatically trigger a “fault.” When this happens, the probe will cease operations immediately, and wait for operators to assess the situation and take the next required steps. One of the reasons for this is has to do with the time delay; given the tremendous distance between Earth and Mars, it takes about 12.5 minutes for instructions to reach the probe, so NASA operators can’t work in real-time. NASA says a fault has already been triggered, delaying the first batch of images that were supposed to have been delivered to Earth this past weekend. Indeed, there’s plenty of time, and NASA can afford to be patient. The InSight mission is scheduled to last for two years. As things get up and running, let’s savor these remarkable images taken from the surface of an alien world.